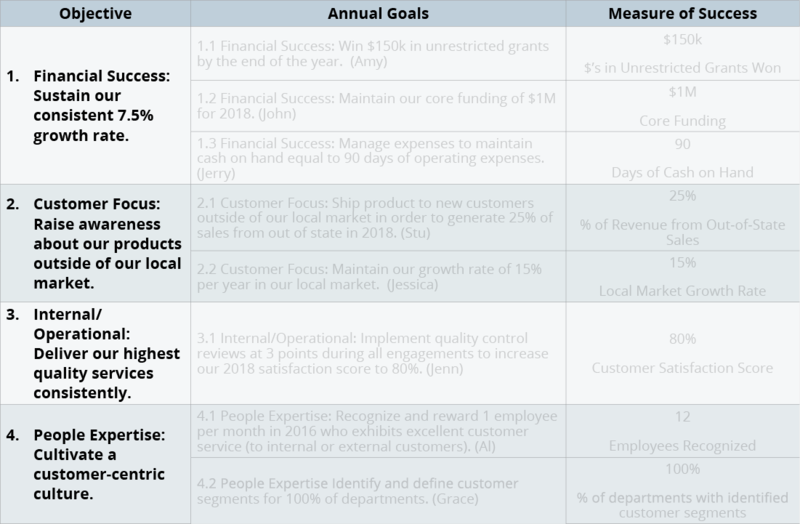 One of the most frequent questions we’re asked is how to create strategic objectives and the aligned annual goals that serve as the backbone to an organization’s strategic plan. 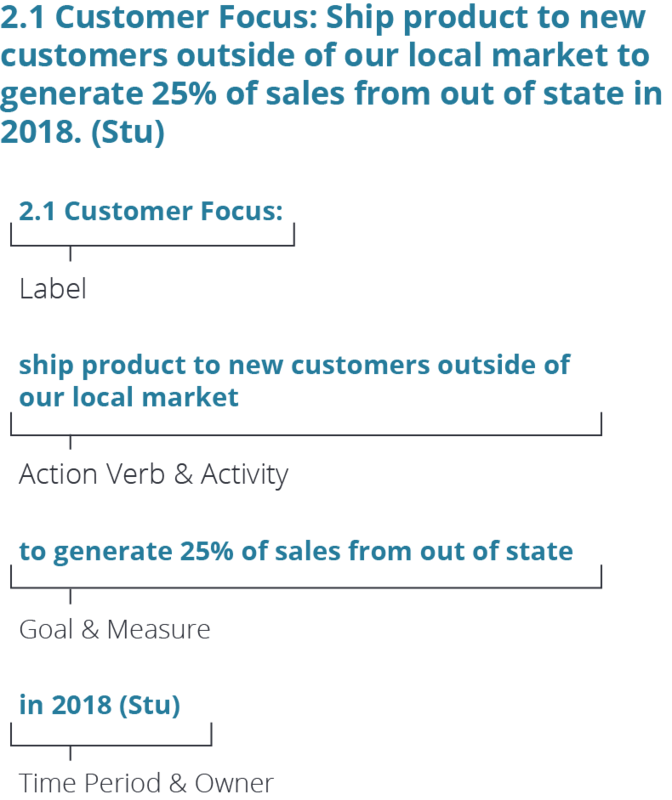 Not to over-simplify the process, we’ve created a quick breakdown on how to develop strategic objectives and aligned goals as an introduction to the process. Strategic objectives create the framework of your plan. Everything will cascade from these statements – think of them as almost mini vision statements for each area of your organization. 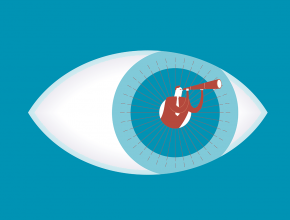 We have an exercise here to help you develop your vision statements and vision descriptors that help build your strategic objectives and plan framework! Don’t know what your strategic objectives should be? 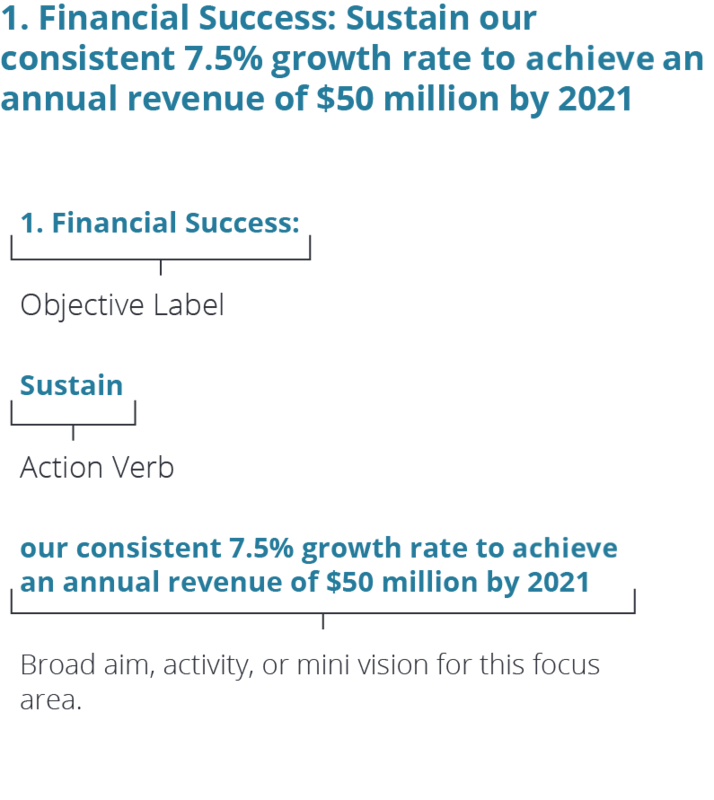 Strategic objectives are long-term, broad, continuous statements with a 3- to 5-year horizon and address the core functional areas of your organization and may include perspectives including financial, customer, operational processes, and staff development. Strategic objectives serve as a framework supporting your organization’s strategic plan. Financial Perspective: What are our shareholders’ or stakeholders’ expectations for our financial performance or social outcomes? Customer Perspective: To reach our outcomes, what value must we provide to our customers? What is our value proposition? Operations Perspective: To provide value, what process must we excel at to deliver our products and services? People Perspective: To drive our processes, what skills, capabilities and organizational structure must we have? Need more help? Check out our post on developing the different types of strategic objectives here. Use your strategic objectives to develop your plan’s framework. It’s important to remember your plan framework should consist of 4-6 holistic strategic objectives. Less than 4 objectives creates an incomplete plan. More than 6 objectives creates a plan that’s un-executable. 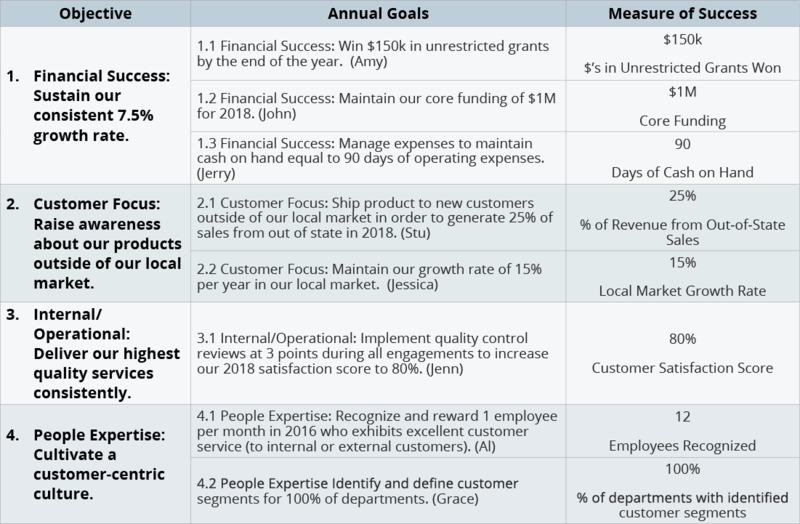 Once you have created your strategic objectives, you’ll need to create the aligned annual goals that clearly communicate to your organization what you need to accomplish in the next year to help achieve your long-term objective. The most important thing to remember here is these are the goals that are the most important right now to reach our long-term objectives.